Home Mental Health CAMHS What’s your experience of CAMHS? Many of our children have to be referred to CAMHS - The Child and Adolescent Mental Health Service - to help manage their behavioural difficulties or perhaps if they are experiencing a difficult period of depression or anxiety. After a very difficult Year 8, largely due to an issue with a particular teacher about whom the less said the better, we found ourselves in this position with Son2, who has Asperger Syndrome. He was referred by his paediatrician at the end of last year. The paediatrician, it later transpired, in the battery of blood tests ordered, had not included a Vitamin D test and so missed that part of his issues stemmed from a severe Vitamin D deficiency. This was only picked up by our forward-thinking GP, when Son2's legs began to cause him pain some weeks later. So, we wait for the CAMHS appointment. And wait. And wait. Meantime, Son2 was finding it difficult to go to lessons and is on many occasions, unable to go to school at all, a stressful situation for the whole family. Then eventually, an appointment arrives, SIX MONTHS after referral. My husband takes the day off and off we go. At the appointment is the paediatrician and a CAMHS psychologist who shall remain unnamed to save their blushes. Son2, predictably, refuses to speak to either of them. We explain Son2's issues, as the paediatrician yawns through the whole appointment, then takes a phone call. At an appointment we have waited six months for. I studiously ignore him. The psychologist agrees to prescribe a trial of a particular medication and says she will call the school to speak to his counsellor there before we get it filled. However, to the best of my knowledge, she does not and we are left with an unfilled prescription a week later, still waiting to hear back from her. I call and leave a message. No response. So, I decide to get the prescription filled although Son2 will only agree to take it after I take him back to our GP who explains to him the effect it will have on him and that he will soon start to feel better, something, presumably, the psychologist should have taken the time to do. Within a couple of weeks, indeed Son2 is feeling better and even manages to go to the local shop by himself for the first time in a year. But there is still no word from the psychologist and we are coming to the end of the bottle. I call the GP who agrees to prescribe a further bottle, even though this is supposed to be a monitored trial. Off we go on holiday, where Son2 has a couple of relapses but is generally much better. When we return, there is still nothing from the psychologist, so I call my GP again to ask who should be monitoring Son2 as we have heard nothing, nor have we received a follow up appointment. She checks her screen and has a recent letter scanned in that says Son2 had been referred to the wrong county sector of CAMHS and had been re-referred to a different local region. They had not bothered to cc us in because, of course, as the child and his parents, we are the least important people in this process, it would seem. I am incensed. And as David Banner used to say just before he turned into the Incredible Hulk - don't make me angry. 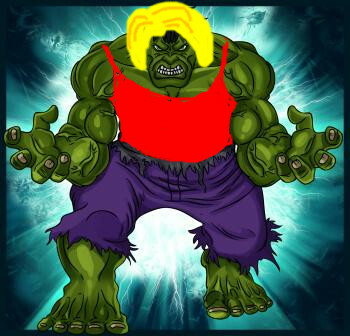 You wouldn't like me when I'm angry. I call the new department to find out what is happening and, to avoid my call going ignored again, I pass on to the lady who takes my details that I am also co-chair of the local parent-carer forum and a response would be appreciated, as I am extremely unhappy at this rather careless administration when they are dealing with a vulnerable child who has been prescribed some serious medication. An hour later, a lady calls me, very concerned that I shouldn't be complaining about them and I assure her that it's not them at fault, but the other CAMHS section. We now have an appointment for 25th September. So, because of this mistake in referral Son2 will have had three months with no monitoring for a child who was only put on an initial trial of an SSRI. It doesn't bode well for the future for an integrated health, education and care plan if they can't even figure out where you should be referred. And at the heart is an autistic boy who has been suffering since the end of last year. Parents should not have to chase for information, it's very distressing, because it makes you feel very alone and insignificant. Because of my position, I happen to know the head of CAMHS in our county (a very sincere person, in my experience) and I emailed her to tell her about the whole sorry tale. As I expected, she was horrified and apologised, assuring me she would ensure Son2 received the right treatment and that she would also take steps to make sure this did not happen to anyone else. However, I am not sure my experience of CAMHS, in any county, is particularly unusual, or even especially bad, and I would be interested in hearing your story too. Really sorry to hear that your experience with CAMHS was so awful and regret to report that to-date I have only heard of similar frustrating experiences. This so-called professional body are failing our children up and down the whole country. I am part of the autism community, raise awareness for children with PDA, volunteer on an autism support line, this really is a serious and common issue. Not only from the stories that I have been told about, but also from my own experience, the service needs a huge re-think because right now it’s a JOKE, and us parents desperately trying to get the right support for our children, WE ARE NOT LAUGHING, it feels like another stab in the back from a system that continues to fail to meet our children’s needs. 9My son was initially refered to CAHMS aged 10, and subsequently was diagnosed with Asperger Syndrome. We live on the border of a town and were refered to the next town, not our LA. He was investigated and diagnosed there, then we had the trauma of high school. The school he went to (not my choice, we lost the appeal for the one I wanted, despite someone from CAHMS and a psychatrist attending the appeal) had no discipline and he suffered random attacks (verbal and physical) in the corridors. After one such occasion, he tried to strangle himself with his tie. I rang CAHMS up, who gave advice over the phone, and came to see him at home on a couple of occasions. At home he was fine, it was at school where the problems where. As she discharged us, she told us that we had in fact been moved to the CAHMS in our local town, but because I had rung her direct she had come to see us. Even now I have had no contact from our “new” CAHMS. I went to appeal again, this time my son got in the school I originally wanted for him, but he will be going in in year 9, this September, and it will still be a traumatic transition for him. I have 20 years experience of teaching, many in Special Needs and occasionally working with individuals associated with CAMHS. Those individuals were usually perfectly pleasant and honourable people but over my dead body will my child ever have anything to do with CAMHS. Sadly I have seen them do too much harm. Sadly everyones comments about CAMHS rings true with me,my son has autism and PDA,we have been trying to get help for about 4 yrs now,we have tried meds,and have been left with no support when my son had dreadful side effects,we have had to call the out of hours Dr to him twice.They have promised to contact school,but this was never done,one Dr even suggested walking him to school in his pjs if he wouldnt get dressed,when i asked about his dignity she implied that we were nt compliant parents,to which I got up and left,another black mark. They now want my son to take sertraline which i am opposed to,and we ve been told that they dont know what else we want them to do if we wont accept an anti depressant.We ve now taken him of his strattera,again no support from them.He is aggressive to myself and his sisters,and keeps escaping and running off,to which they tell me to ring the police. In desperation we are paying £300 to take him to a private consultant,we have no faith in CAMHS at all. I have been asking my GP for help since my son was aged 2 (now nearly 9) FInally got referral last year and had a shocking appointment with a stand in doctor who was meant to try and help with backlog of appointments – who forced him to look at her close up and prodded him! I left in tears. Finally got to see our wonderful paediatrician in Dec but due to lack of funding and support it is taking ages. We were referred to speech therapist back in Oct and still don’t have an appointment (they can only run one clinic a month). Without speech therapist report the MAAT can’t meet to discuss him. Now about to start another hellish year of battles with trying to get him into school and happy and yet again no one to one support as no ‘official diagnosis’ There is not enough money for childrens’ mental health support which is a disgrace as children are suffering – my son cries and asks for help. These children need help while they are young to enable them to lead positive lives. We now see a perfectly lovely Dr at the community paediatric department of the local hospital – Much much better!! I would also like to add that our community paed is who we see now and is wonderful. The specific child mental health service dept were shocking – they didn’t even want to see my son. It was all about seeing me and teaching me parenting skills. I understand the logic in this but I have read so many books and done so much research that I didn’t need this. I wanted someone to talk to my son and try to understand him and help him to understand the way he feels and the way he looks at the world compared to his peers. Even my GP was surprised they didn’t want to see him. I can’t express my gratitude to my daughter’s psychologist from CAMHS. She was wonderful. We had to wait for over a year before we eventually saw her, but when we did, I couldn’t have been happier. So it’s not all doom and gloom. Now if you were to have asked about social services, I’d have had a totally different reaction… They were the ones who caused more pain and suffering than they ever helped. Can’t believe they’re supposedly ‘professionals’. Sadly, I am not surprised by anything you’ve said about CAMHS. I’ve written about this service many a time on my own blog as my son has been under CAMHS since 2009. The biggest problems I’ve encountered are long waiting lists and an inflexible service that doesn’t seem to totally understand autism and the impacts on the family. When my son first became unwell, the school responded quickly and referred us to CAMHS but we had to wait three months for an initial assessment. This may not sound long but for an autistic person who had become suddenly mentally unwell, this is too long because during that time he deteriorated further until he couldn’t leave the huose at all. He was in a very bad state and had regressed autistically as a result. While I did everything I could it was not ennough as my son required medication to alleviate his symptoms which we were forced to wait months for. If that wasn’t difficult enough, CAMHS were then very reluctant to make a home visit saying that my son was not poorly enough. They didn’t seem to get that an autistic person with agoraphobia could not get to the clinic and instead blamed my parenting and suggested my husband might have better luck at getting him out. This is not an attitude I expect from mental health professionals and it seemed to me that they were rigidly following some rules on home visits rather than being adaptive to the needs of the client! As for my aspergers daughter, she had a mental health assessment last year, well it was supposed to be but it turned out to be an interrogation of our parenting. I even asked if they were going to assess her but the nurse just asked me “what do you want us to do then”. And this from a mental health nurse. It was quite clear to me that she had no proper understanding of aspergers and was totally out of her depth. As it was it was decided that her difficulties lay with school but that my daughter would have a follow up appointment. So we waited for an appointment but heard nothing. Wen we did hear from them, we were told that because we had failed to turn up for an appointment that our daughter would be discharged. We couldnt recall receiving an appointment and even if we had where is the compassion for our situation. With two children with ASD and both out of school, life is not easy and it is quite possible that we mixed up our appointments though I doubt it. Even when our daughter dropped out of school recently CAMHS refused to see her!! They told our Ed Psychologist that they had already seen her but that was nearly a year beforehand. Had it not occured to them that someone could develop a mental health condition in that time. Not surprisingly, I am very disappointed with the service. I find the service is not run very well and there is an inflexible attitude to its clients. I also feel there is an inclination to blaming parents rather than properly understanding the impact of an ASD on family life. It is very worrying because if there is one part of the NHS that should get autism or aspergers it should be CAMHS. We had an awful experience of our local CAMHS. The Paediatrician we saw demonstrated no knowledge of childhood trauma (the reason we were there), made some shockingly crass statements in front of my son and couldn’t get his prescription pad out of his pocket quickly enough. The service is patchy, underskilled and understaffed. I feel that children with mental health issues generally receive an inferior service to adults. I can only comment that we as a family have had fantastic support from our CHAMS team , and i am not sure we could have coped without it. My son had post traumatic stress disorder following radical cancer treatment. He has a fantastic psychologist and psychiatrist , who not only understood him but helped us as a family when his anxiety became too great and he developed anorexia nervosa. Subsequent to this they realised that he had underlying asphergers and modified his sessions accordingly. They also very under resourced as an area of the NHS and are being heavily targeted for cuts despite the numbers of children being diagnosed with mental health issues. I have been unfortunate enough to have my child refer to CAMHS, unlike the other posts, my child only got to see a social worker, who assessed him for ASD – even though he was not referred for that! she also embarked on some therapy which she had no understanding off and no qualifications in! When I complained I was referred to SS for ‘bad parenting’ – the SS were embarrassed, disagreed with everything CAMHS said and closed the case. so much for helping young people … further research disclosed that there were NO qualified psychologist /psychiatrist and the whole place is run by social workers – its a disgrace! My advice for anyone attending CAMHS to to ask for their qualifications up front – not their job titles as many are saying they are ‘mental health clinicians’ whereby they have no mental health qualifications/ nor medical backgrounds! BEWARE!!! I’m in a position where my daughter has not been diagnosed with anything yet but she is going downhill extremely fast. Behavior, attitude, aggression, sleeping patterns, schooling all very very bad now, her anxiety is through the roof and self esteem rock bottom but after 5 appointment at Camhs now she is just playing games with a psychologist to get to know each other! The situation is tearing my family apart and we are not sleeping, eating nor drinking properly. My other children are really struggling to cope now and we need help as a family because of it all. Camhs are not bothered by the home situation and in there words, we are assessing Katie not her siblings nor her parents! Ian, have you been offered family therapy? CAMGS should be able to do this. If not, find out who is the head of CAMHS for your area and complain to them. if no joy, complain higher. CAMHS is a health provision and as of next month, health providers are all changing. Visit contact a family website or call them for advice. My Camhs team are I am sorry to say just as bad as the rest of them. Have 2 kids under them ,1 with anxiety and depression and also due to us going private, a diagnosis of PDD She has been assaulted by a doctor who was supposed to be helping her. We kicked up a fuss and very quickly got a meeting and were promised immediate help. My child is still desperate and so low that they have not been to school for nearly 2 years. When I asked how to help get her into college they replied, she has to do that for herself???? My other child is still not any further on being assessed it is blamed on parenting. HELP…………..
My experience with CAMHS is still ongoing, when my son was first referred ,at my request, the primary mental health worker fobbed us off, effectively saying he would ‘outgrow’ his autistic traits. Foolishly I belived him, that was 3 years ago. He is now 10, we struggled on with his unusual and at times worrying behaviour and last year my son became very unhappy, started to refuse school and started to feel suicidal (and make some crude attempts) the school were legally ‘helping’ but in reality only making it worse (by saying similar things as I am reading above, like ‘he has to pull himself together’ and ‘the most important thing is that he is in school every day’) When he had a breakdown in October we felt so helpless and scared we drove him to A&E- we didn’t take him in but when we told the same primary mental health worker we had seen 3 years earlier about this he laughed incredulously- and asked why on earth we had done that. Absolutely incredible behaviour from a ‘professional’. He was ready to fob us off again- saying our son didn’t meet the diagnostic criteria (how did he know, he had never, and to this day has never laid eyes on our son!!!) but this time, things were very bad and after our son made suicide attempts and with the support of our great GP, he finally finally referred him for assesment- we realised we were not going to get any actual help from anyone especially not CAMHS so took him out of school. The person I am seeing at Camhs is very nice and sympathetic, I think she is a nurse- I am really hoping we will finally get a diagnosis, I know he has Aspergers, I have known since he was 2 there was something unusual about him. It is maddening that as a parent you are required to fight a system that is so obviously flawed but is presented as there to help your child- no one can help him, only us, by educating ourselves and by making our own decisions. I will homeschool him if need be- at the moment he is going 2 days a week, school are not happy but we are standing firm,and until we have a diagnosis we are not making any promises and not paying any attention to the ill-informed bureaucratic demands from the school. do i as a parent have no rights regarding my sons care i no longer want him under camhs i feel they have no intention of helping him and would rather blame us as parents, we have been told we cannot take him out of camhs as camhs have to approve his medication, we were also told the person he sees now has to agree to him seeing someone else(highly unlikely) and if we have a complaint about them it goes straight to the person u are complaining about how is that suspose to help how do i get my son out of camhs…. My now 17 year old Daughter was referred to CAMHS following a diagnosis of anorexia by her GP – the reason why my Daughter actually ended up with anorexia in the first place was due to her suffering from PCOS which caused huge weight gain, the solution of which was for her to go on a strict calorie controlled diet (this was monitored by her paediatrician and dietician) which for several reasons ended up going too far! Anyway, all CAMHS was concerned with was my Daughter gaining weight immediately – her stopping losing weight during the first week wasn’t good enough – she had to gain weight immediately. CAMHS and a new dietician insisted that she start eating all the foods that she had been banned from eating for the previous 2 years. My Daughter got increasingly depressed and withdrawn, but were CAMHS interested – No. As long as she put on weight fast that’s all they were concerned about. My Daughter was in tears every session and they were very inflexible about appointment times – I had to take so much time off work to make all these appointments and the petrol cost in travelling was horrendous. Anyhow – the outcome of this was that my Daughter met her weight target and they wanted her off their books as fast as possible – they had met their objective. Following the disastrous numerous appointments with CAMHS, my Daughter ended up with Bulimia, her hormones all over the place, severe depression and a non existent self-esteem. Unfortunately, in our area the GP cannot help with young people under the age of 18, they must be referred to Paediatrics and CAMHS – the two services who have unfortunately made her life a misery. Both she and I are looking forward to her turning 18 so that her GP can help her direct. I should also point out that the way that I was treated by CAMHS was extremely dismissive, they didn’t care at all about the stress that I was under throughout the whole of this shambles (I was also having to go through a reorganisation at work and my staff needed me there as well) and this resulted in me having a complete breakdown (As an Adult my GP prescribed anti-depressants and organised Counselling – it was all done very quickly and efficiently and the Counsellor was brilliant – nothing like the people at CAMHS). I hm father to a 13 yr old girl with Asperger`s. When she started to develop symptoms of OCD I asked for a referral through the Autistic Support Team. 8 months later we were referred for CBT. By that time her symptoms had become worse, and she had stopped going to school and had become very restricted in her eating. After 2 sessions of CBT of half an hour a time, they said that the therapy was not working, and suggested more specialist help from a unit such as Maudsley. I agreed with this, but with the qualification that it would need to be done very slowly and carefully, to avoid the trauma that sudden change creates in those with ASD. A locum CAMHS psychiatrist came out to see her and again mentioned a specialist unit, adding that if I did not agree they would invoke the Mental Health Act to force her to a unit. I commented that I found it odd that he was threatening me when I was actually agreeing with him. The next day, 6 people, comprising of 2 AMPs, 2 police, and 2 psychiatrists forced their way into our home with a Warrant, broke her bedroom door and tried to give her a a Mental Health Assessment. Because she has ASD, she cannot cope with even one unexpected visitor, let alone 6 people breaking in and terrorizing her. She went into complete shutdown in a foetal position. They all left without explanation and she was left curled in a ball on the floor. She is now scared of a knock on the door, and quite honestly, so am I.
I have made a formal complaint about this, and my daughter is getting no help. Ask these blundering incompetents for help at your peril. So sorry to hear of your trauma. My 16 year old ASD depression and anxiety has been made worse by CAMHS. (Stockport). She is now housebound after being left home alone for the whole of year 11. ” years down the line we are no better after begging every service for help for 3 years. Who will help these children? I can only add to the catalogue of misery expressed here. My daughter is 14 diagnosed ASpergers 3 years ago. Initially I was told by my GP to go to CAMHS for a diagnosis this information was incorrect. at the time the PCT had a policy of refusing to give any help to ASD children because they did not fit their “criteria”. This is still the case now 2 years on but it is more covert. The children languish on the waiting list. Complaining may get you seen but you then realise that the clinical psychologist seeing your child is only doing so under duress. They have no evidence based legitimate approaches to treating the various forms of ASD. The service is totally unprepared for the volume of referrals and many of the clinicians are prejudiced against ASD because of their preconceptions and their lack of real training or research into developing specialised treatments. The psychologist who saw my daughter had not even read her notes had no plan of treatment and on second appointment withdrew therapy because I asked her about her experience of helping ASD children and what she understood about the issues around working with a child who although seeming to be very able had language comprehension difficulties and may need us to know exactly what was being said in her therapy………. thats when she told us to get out of the building. The NAS advises parents to ask questions but unfortunately this may cause problems as many of these clinicians feel that they are a protected and superior race and they react in a very hostile manner to being asked to explain themselves. We are the experts when it comes to our children, however CAMHS appears to seek to disempower parents and this is entirely I appropriate and counterproductive. Wow, what a story! Did you make an official complaint? It would be good to try to build up a big picture of people’s CAMHS stories to try to improve the service where it is sorely lacking! If you have already spoken to CAMHS about your daughter’s suicidal,thoughts to no avail, you can complain about the service or ask for a second opinion. I know that even so, you may not get satisfactory help so here are also other sources of support. Have a look at the help here and call the helplines for advice on how to proceed. Our son(9) was referred to camhs last summer after taking him to gp with high.anxiety. They were initally very good and it was his therapist there that picked up on him possibly being on spectrum. He was referred to a locum consultant physc who went on first meeting agreeing he needed an asd assessment to.changing his mind and us having to fight for one. He gad ados assessment 7 wks ago and are still waiting for results!! On top of this his thereapist went on long term leave (which couldnt b helped) in july and isnt starting bk till end nov. Our son hasnt seen anyone over this time. This is a little boy who at worse was talking about not wanting to be here becaus of how awful his life was in his words!! Is this feed still live? I can tell you that CAMHs has not got any better. that it wasn’t unusual for children his age to display these types of behavior. that this was how children behave. fairly confident that it was age related and that he would soon grow out of it. myself back down the GP to try to get some kind of answers. handled, but all in all they did a great job of supporting my son. one) to the point where I have to lock the kitchen door….…. CAMHs – if I can get them involved. hes not in the house. have to call the police and he is returned after getting on a tram…… and a bus…..
and going to his aunt’s house. think the GO would have got the picture! after an initial assessment with Early Help I finally let my feelings pour out. years! We have his hearing checked in case that is the reason he doesn’t listen. plan and have TAFT meetings. behavior shows that he may have ADD, ODD and is on the autistic spectrum. the sensory issues, the refusal, the disrespect the anger…. The strange behaviors……..
here it is” so she wasn’t even reading her own notes. at night and then said see you in 6 months. hated that woman. She was in it for her wages. emotional problems and childhood insomnia. feel seriously let down by CAHMs they are a rubbish SERVICE! awful – and half the time he doesn’t know what hes in there for! this time the school know there is something wrong….. and are supporting me. do I have to do? Who do I have to plead with?